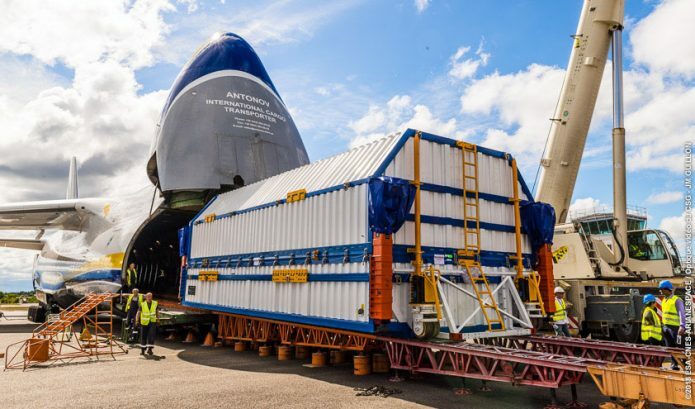 The protective container with GSAT-11 is unloaded at French Guiana’s Félix Eboué Airport. 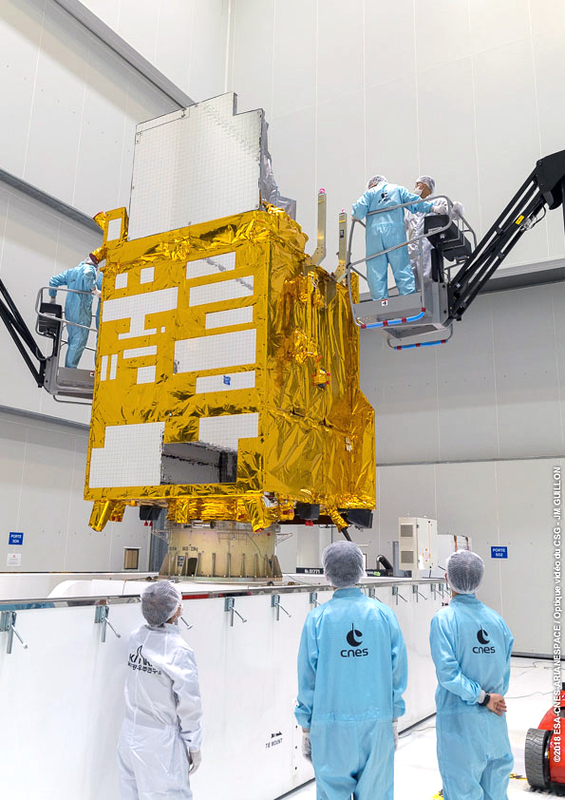 The two passengers for Arianespace’s next Ariane 5 flight – the GEO-KOMPSAT-2A and GSAT-11 satellites – are now in French Guiana where launch preparations are moving into a new phase for liftoff during December. 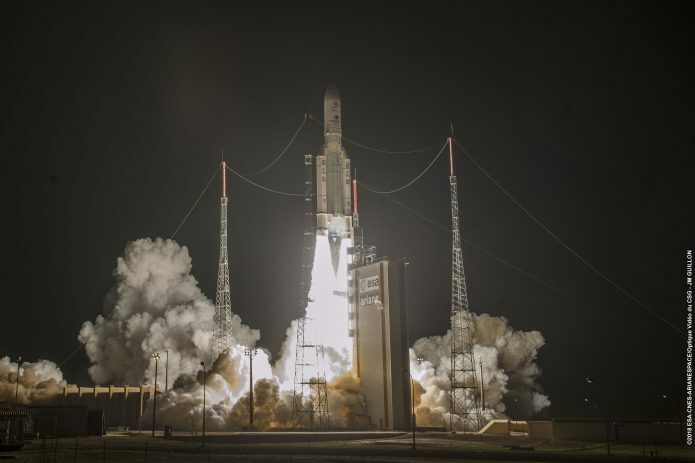 The latest-delivered spacecraft, GSAT-11, was flown to South America on October 26, while the first of the two satellites, GEO-KOMPSAT-2A, arrived at Félix Eboué Airport near the French Guiana capital city of Cayenne on October 20. KOMPSAT-2A begins its processing in the Spaceport’s S5 payload preparation facility. 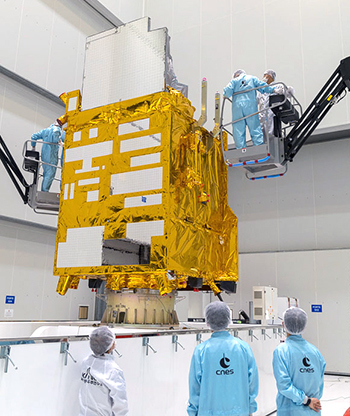 As part of this familiar step in mission preparations, satellites delivered via cargo jetliner are unloaded at Felix Eboué International Airport then readied for transfer by road to the Spaceport for on-site payload processing – including fit-checks, fueling and integration with the launcher. GSAT-11 was designed and assembled by the Indian Space Research Organisation (ISRO). This advanced communications satellite is to provide multi-spot beam coverage over the Indian mainland and nearby islands, bringing significant advantages to the user community when compared with India’s existing INSAT/GSAT satellite systems. The Korea Aerospace Research Institute’s GEO-KOMPSAT-2A will primarily provide meteorological observation and space weather monitoring. Ariane 5’s mission in early December, designated Flight VA246 in Arianespace’s numbering system, will be the 246th with an Ariane series vehicle and the company’s tenth overall launch this year across its complete launcher family – which also includes the lightweight Vega and medium-lift Soyuz.